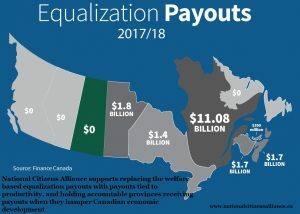 The National Citizens Alliance (NCA) believes that equalization payouts are detrimental to the provinces and Canada as a whole, by adding to the welfare, entitlement federal governance through handouts to less productive provinces, penalizing more productive provinces, and decreasing competition between provinces. Canada is facing a growing financial crisis from growing federal debt, which is tied to the inefficiencies and waste of the welfare, entitlement federal governance. See our fiscal responsibility policy statement for more information. The NCA believes that we need to take action now to address the root causes of the growing financial crisis. The Rescind Equalization Payouts policy statement requires a vote of the NCA membership to be adopted. A minimum 70 percent voting membership must support the policy and with a 50 percent quorum of voting membership as per the NCA Constitution (2014).